Her Majesty was at the naval base this afternoon in her role as the sponsor of HMS Lancaster. 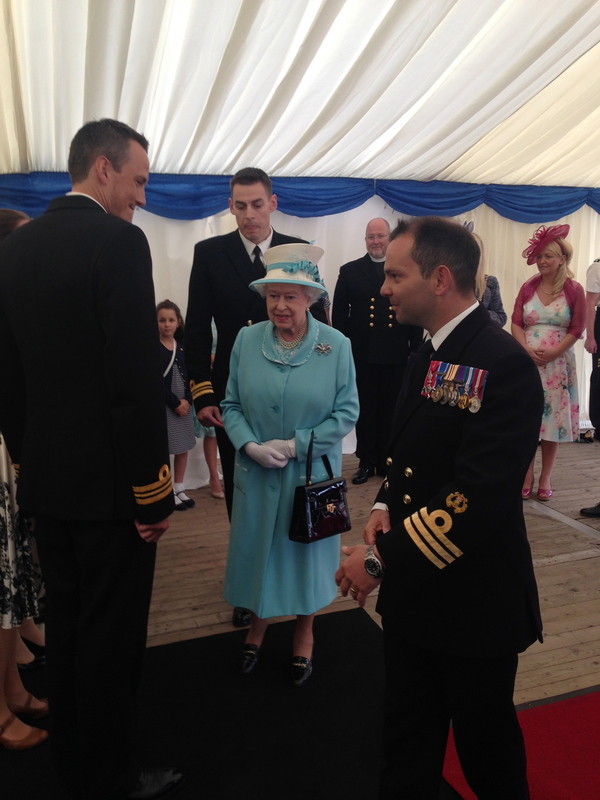 The Queen has met the crew of a Royal Navy frigate which she launched 24 years ago. She was given a tour of HMS Lancaster, known as the "Queen's Frigate" while it was alongside at Portsmouth Naval Base, Hampshire. The Queen officially launched the ship on May 24, 1990, and in her capacity as the Duke of Lancaster she is the ship's sponsor and most recently visited it in 2004 and again in 2006. Wearing a sky blue Karl Ludwig dress with a white Angela Kelly hat, the Queen was greeted by the naval base commander Commodore Jeremy Rigby before she received a royal salute, and the national anthem was played. "I feel really privileged, it's nice to see it's getting noticed, that it's not just a job, it's a career and you feel a part of something." "I told her we were responsible for maritime security and radar collision. "It's good to see the sponsor of the ship, it keeps morale high, it's good publicity for the Royal Navy." "We are honoured with a visit from our Lady Sponsor, Her Majesty the Queen, who launched the ship in 1990. It provides us with an excellent opportunity to update Her Majesty on HMS Lancaster's recent activities including our successful counter-narcotics deployment in the North Atlantic and Caribbean. "Throughout this, Lancaster remained poised to respond to any natural disaster and ready to provide life saving support. I am extremely proud of my ship's company who worked tirelessly over a seven month period on the front line of naval operations and ultimately protecting our nation's interests." "Lancaster has the privilege of being The Queen's frigate. Seven months was a long time to be away from friends and family, however the success of the deployment made the time away worth it."